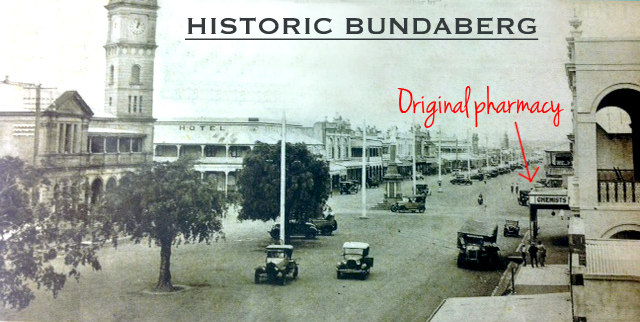 The Friendly Society Pharmacy Bundaberg has seen many changes since it first opened in 1920. To this day the Friendlies is the only community owned pharmacy to provide uninterrupted healthcare services to our local community for such an extraordinary length of time. People often ask about the origins of the Friendly Society Pharmacy, who makes up the Friendly Society, who owns the Friendly Society and so on? The answer is, the pharmacy is a not for profit organisation which is run for the betterment of the community and where all profits are re-injected into the operations of the business. This is quite unique in today’s environment of healthcare delivery. From humble beginnings financed through a 10 pounds and 10 shillings loan and a 2 shillings and 6 pence levy per member the Bundaberg Associated Friendly Societies’ Medical Institute was first registered on the 8th October, 1919 and now, some 90 years on, still stands proud in Bundaberg and the surrounding areas. In January 1920, Mr W E Steppensen was appointed Dispensary Manager by the Bundaberg Associated Friendly Societies’ Medical Institute, and commenced duties in leased premises with a salary of 52 pounds a year. Just one year later the Dispensary Manager tendered his resignation and a new Manager (Mr B J Wilkins) was appointed. Also during the course of 1920 a parcel of land owned by the National Bank at the corner of Bourbong and Barolin Streets was for sale and it was agreed that this land be purchased and a Dispensary be erected. A sum of 315 pounds was set aside for the purchase of the land and the building of the Dispensary. The new Dispensary was opened on 1st April, 1921 with a Manager and one assistant. At a special meeting of the General Committee held on 26th February, 1930 it was decided to erect a Lodge Room on top of the dispensary building. The cost of this project was 1,200 pounds and was officially opened by the Mayor of Bundaberg, Ald. B. McLean in the presence of a large gathering of Lodge Members and Medical representatives. When the Manager Mr BT Wilkins resigned, Mr KW Curtis was appointed. After he resigned Mr Cliff Hislop became Manager. In 1956 the Dispensary shop was completely refurbished and new counters and display windows were fitted, at a cost of 3,403 pounds and ten shillings. This work was carried out by Mr Lohse. In 1958 the Manager Mr Hislop resigned and Mr John Pirnie became the new Manager and managed our Bourbong Street Pharmacy until 1987. By this time the Dispensary was bursting at the seams and the Institute saw fit if they were to offer better returns and service to their Members, to relocate the Dispensary to the Ground Floor of Wide Bay Capricorn House, on the corner of Barolin and Woongarra Streets. On the 12th February, 1987 the Institute appointed Mr John Waring to the position of Dispensary Retail Manager, in preparation for the Managers position when the Pharmacy moved. The new shop was fitted out and the Dispensary relocated shortly after. Mr Pirnie continued to be employed as a Pharmacist. At a General Committee Meeting on the 5th February, 1992 the Pharmacy Manager Mr Waring’s appointment to the Medical Institute was terminated. For a period, the Pharmacy was managed by section Managers, including Mr Pirnie. The Pharmacy turnover and scripts in 1994 increased to the extent that the Board of Directors recommended to the General Committee that larger premises should be purchased. On approval from the General Committee, premises across the street, formerly the Burnett Shire Council premises was purchased. The Dispensary increased in popularity, and over the past 90 years has continued to deliver members and the local community a friendly and personalised pharmacy service that represents real value. While it is important to focus on the future, we should also take time to reflect on the past achievements of the Medical Institute and also the personal endeavours of those who consolidated a legacy for future generations to inherit. It is without a doubt that the history and ownership of the Friendly Society Pharmacy is quite unique when you consider the landscape of the Australian healthcare industry. The pharmacy’s not-for-profit status ensures continual reinvestment in all facets of the business including new technology, equipment, facility improvements and most importantly its people. While it is important to focus on the future, we should also take time to reflect on the past achievements of the Medical Institute and also the personal endeavours of those who consolidated a legacy for future generations to inherit.